Lawyer for Tortured Detainees: U.S. Created ISIS Through Misguided Detention, Interrogation Policies | Democracy Now! AMY GOODMAN: Very quickly, Shayana, before we go, you’ve been talking about the origins of ISIS. SHAYANA KADIDAL: Sure. 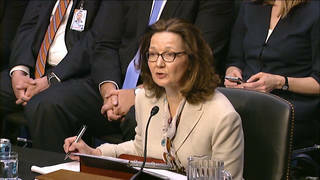 I think, you know, with everything that’s in the news lately, it’s important to remember something that got buried when it was first reported on, right when the torture report summary came out in late 2014, which is that 25 of the 27 top leaders of ISIS were all held together by the United States in Camp Bucca, which was a Guantánamo-like detention facility where we held both kind of religious radicals, like Abu Bakr al-Baghdadi, who was there, and a whole bunch of people from the Baath Party, who were bureaucrats and military experts, generals from Saddam Hussein’s army, right? And, you know, the crazy kind of mix that we have with ISIS of religious millenarians and people with actual expertise in running battlefield campaigns, which you usually don’t see, because good generals usually don’t think the rapture is coming tomorrow, that was pulled together in Camp Bucca, where people were being abused because of their sectarian affiliation and their Muslim religion, right? Just like what happened at Guantánamo and Abu Ghraib and everywhere else. So, you know, bottom line with ISIS is—and we see this reported so infrequently—is we made this. We created this movement and its leadership with our own misguided and amateurish detention and interrogation policies. And by keeping Guantánamo open, by speaking approvingly of torture, President Trump is doing nothing more than running a long-standing kind of commercial for ISIS. AMY GOODMAN: Shayana Kadidal, we want to thank you for being with us, senior managing attorney at the Center for Constitutional Rights. When we come back, we’ll be joined by the Senate president pro tem of the California Senate. We’ll be back with him in a moment.